Inside History Magazine Issue 10 is now available. 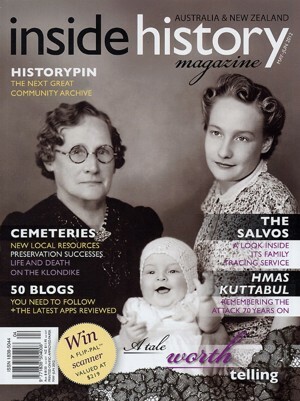 Inside History Magazine is the perfect reading material people who are passionate about Australian and New Zealand genealogy, history and heritage. Cemeteries: preservation success stories, and new resources. Did your ancestor travel to the Klondike to strike it rich in the 1890s? Read the exclusive new research. Meet the volunteers who’ve traced the descendants of those who died on HMAS Kuttabul in 1942. Explore The Australian Women’s Weekly, now digitised for Trove. Find out how Phryne Fisher creator, Kerry Greenwood, researches her murder mysteries. Find details of 50 genealogy blogs you need to follow. Discover Historypin: Which is touted as the next great community archive. Plus, there’s a fantastic Flip-Pal™ scanner to be won! All of this packed into into one magazine guarantees you a great read. Still not convinced? Inside History even offers you a sneak peek of it. You can buy the printed copies of the magazine from us at Gould Genealogy & History. A number of societies and newsagents around Australia stock it as well. Copies of back issues 1-9 are available at $10.50 each. Click here for details.